How much do emotions affect chronic pain? A considerable amount, according to Dr. Susan Babel, a psychologist that specializes in trauma-induced depression. 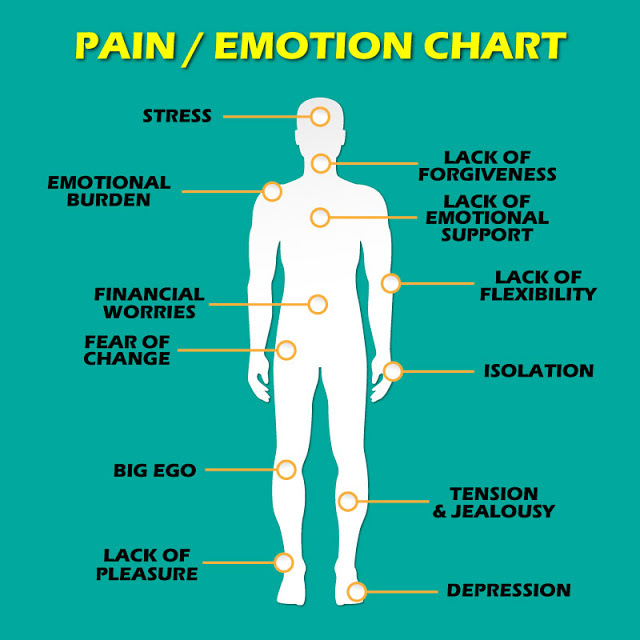 So what does the chronic pain one feels say about his or her emotional state? 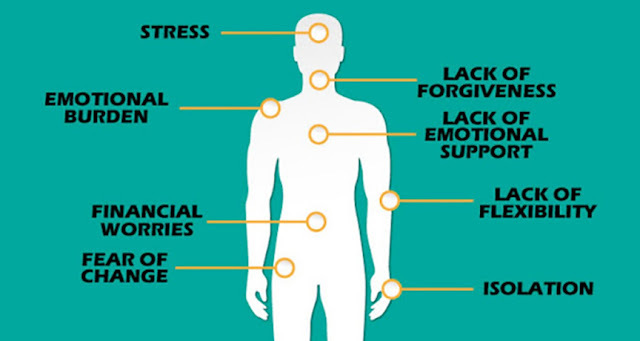 Lack of emotional support can manifest in upper back pain. Maybe one does not feel appreciated, or they are holding back feelings of affection. If one is in a relationship, maybe have a discussion about feelings. If one is single, it might be time to branch out. Arm and elbow pain may mean a lack of flexibility. Maybe one is resisting the natural changes that are occurring in their lives. Try shaking things up and going with the flow. Attempting to fight change only brings trouble. Fear of moving, change and waiting to make a big decision could all cause pain in the hips. Make the changes one needs and move on needed. Also, make a choice and stick with it! Knee pain may mean that one thinks too highly of themselves. Spend some time volunteering and remember that all people are mortal. No one is free of imperfections. Emotional tension, stress or jealousy may be the cause of calf pain. It may be time to let go of any big stressors in one’s life or to dump the jealousy. Depression can lead to foot pain. Depression is hard to beat, but there are some things one can do to fight back. Try a new hobby or adopt a pet. Find something that gives joy! If you have some time, take a look at the lecture below. It is long but packed full of valuable information!